For the film by John Lennon and Yoko Ono, see Apotheosis (film). For the series by Douglas Hill, see Apotheosis (series). "Autotheism" redirects here. For the album by The Faceless, see Autotheism (album). "Deified" redirects here. For the album by Keak da Sneak, see Deified (album). For discussion on the theory that a deity was once an actual living person, see Euhemerism. 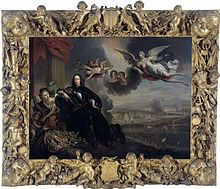 The apotheosis of Cornelis de Witt, with the raid on Chatham in the background. The original by Jan de Baen, kept in the City Hall of Dordrecht, was destroyed in 1672. Apotheosis (from Greek ἀποθέωσις from ἀποθεόω/ἀποθεῶ, apotheoo/apotheo "to deify"; in Latin deificatio "making divine"; also called divinization and deification) is the glorification of a subject to divine level. The term has meanings in theology, where it refers to a belief, and in art, where it refers to a genre. Before the Hellenistic period, imperial cults were known in Ancient Egypt (pharaohs) and Mesopotamia (since Naram-Sin). From the New Kingdom, all deceased pharaohs were deified as the god Osiris. From at least the Geometric period of the ninth century BC, the long-deceased heroes linked with founding myths of Greek sites were accorded chthonic rites in their heroon, or "hero-temple". In the Greek world, the first leader who accorded himself divine honours was Philip II of Macedon. At his wedding to his sixth wife, Philip's enthroned image was carried in procession among the Olympian gods; "his example at Aigai became a custom, passing to the Macedonian kings who were later worshipped in Greek Asia, from them to Julius Caesar and so to the emperors of Rome". Such Hellenistic state leaders might be raised to a status equal to the gods before death (e.g., Alexander the Great) or afterwards (e.g., members of the Ptolemaic dynasty). A heroic cult status similar to apotheosis was also an honour given to a few revered artists of the distant past, notably Homer. Archaic and Classical Greek hero-cults became primarily civic, extended from their familial origins, in the sixth century; by the fifth century none of the worshipers based their authority by tracing descent back to the hero, with the exception of some families who inherited particular priestly cults, such as the Eumolpides (descended from Eumolpus) of the Eleusinian mysteries, and some inherited priesthoods at oracle sites. The Greek hero cults can be distinguished on the other hand from the Roman cult of dead emperors, because the hero was not thought of as having ascended to Olympus or become a god: he was beneath the earth, and his power purely local. For this reason hero cults were chthonic in nature, and their rituals more closely resembled those for Hecate and Persephone than those for Zeus and Apollo. Two exceptions were Heracles and Asclepius, who might be honoured as either gods or heroes, sometimes by chthonic night-time rites and sacrifice on the following day. Up to the end of the Republic, Romans accepted only one official apotheosis: the god Quirinus, whatever his original meaning, having been identified with Romulus. Subsequently, apotheosis in ancient Rome was a process whereby a deceased ruler was recognized as having been divine by his successor, usually also by a decree of the Senate and popular consent. In addition to showing respect, often the present ruler deified a popular predecessor to legitimize himself and gain popularity with the people. The upper-class did not always take part in the imperial cult, and some privately ridiculed the apotheosis of inept and feeble emperors, as in the satire The Pumpkinification of (the Divine) Claudius, usually attributed to Seneca. At the height of the imperial cult during the Roman Empire, sometimes the emperor's deceased loved ones—heirs, empresses, or lovers, as Hadrian's Antinous—were deified as well. Deified people were awarded posthumously the title Divus (Diva if women) to their names to signify their divinity. Traditional Roman religion distinguished between a deus (god) and a divus (a mortal who became divine or deified), though not consistently. Temples and columns were erected to provide a space for worship. The Ming dynasty epic Investiture of the Gods deals heavily with deification legends. Numerous mortals have been deified into the Daoist pantheon, such as Guan Yu, Iron-crutch Li and Fan Kuai. Song Dynasty General Yue Fei was deified during the Ming Dynasty and is considered by some practitioners to be one of the three highest ranking heavenly generals. Various Hindu and Buddhist rulers in the past have been represented as deities, especially after death, from Thailand to Indonesia. Even several Sultans of Yogyakarta were semi-deified, posthumously. Deceased North Korean leader Kim Il-Sung is the principal object of the North Korean cult of personality in which he is treated similarly to an explicitly apotheosized leader, with statues of and monuments dedicated to the "Eternal President", the annual commemoration of his birth, the paying of respects by newlyweds to his nearest statue, and the North Korean calendar being a Juche calendar based on Kim Il-sung's date of birth. Instead of the word "apotheosis", Christian theology uses in English the words "deification" or "divinization" or the Greek word "theosis". Traditional mainstream theology, both East and West, views Jesus Christ as the preexisting God who undertook mortal existence, not as a mortal being who attained divinity. It holds that he has made it possible for human beings to be raised to the level of sharing the divine nature: he became one of us to make us "partakers of the divine nature" "For this is why the Word became man, and the Son of God became the Son of man: so that man, by entering into communion with the Word and thus receiving divine sonship, might become a son of God." "For He was made man that we might be made God." "The only-begotten Son of God, wanting to make us sharers in his divinity, assumed our nature, so that he, made man, might make men gods." Deification (Greek theosis) is for Orthodoxy the goal of every Christian. Man, according to the Bible, is 'made in the image and likeness of God.'. . . It is possible for man to become like God, to become deified, to become god by grace. This doctrine is based on many passages of both OT and NT (e.g. Ps. 82 (81).6; II Peter 1.4), and it is essentially the teaching both of St Paul, though he tends to use the language of filial adoption (cf. Rom. 8.9—17; Gal. 4.5—7), and the Fourth Gospel (cf. 17.21—23). The language of II Peter is taken up by St Irenaeus, in his famous phrase, 'if the Word has been made man, it is so that men may be made gods' (Adv. Haer V, Pref. ), and becomes the standard in Greek theology. In the fourth century, St. Athanasius repeats Irenaeus almost word for word, and in the fifth century St Cyril of Alexandria says that we shall become sons 'by participation' (Greek methexis). Deification is the central idea in the spirituality of St. Maximus the Confessor, for whom the doctrine is the corollary of the Incarnation: 'Deification, briefly, is the encompassing and fulfillment of all times and ages,' . . . and St. Symeon the New Theologian at the end of the tenth century writes, 'He who is God by nature converses with those whom he has made gods by grace, as a friend converses with his friends, face to face.' . . . The Roman Catholic Church does not use the term "apotheosis". Corresponding to the Greek word theosis are the Latin-derived words "divinization" and "deification" used in the parts of the Catholic Church that are of Latin tradition. The concept has been given less prominence in Western theology than in that of the Eastern Catholic Churches, but is present in the Latin Church's liturgical prayers, such as that of the deacon or priest when pouring wine and a little water into the chalice: "By the mystery of this water and wine may we come to share in the divinity of Christ who humbled himself to share in our humanity." The Catechism of the Catholic Church quotes with approval Saint Athanasius's saying, "The Son of God became man so that we might become God." Catholic theology stresses the concept of supernatural life, "a new creation and elevation, a rebirth, it is a participation in and partaking of the divine nature" (cf. 2 Peter 1:4). In Catholic teaching there is a vital distinction between natural life and supernatural life, the latter being "the life that God, in an act of love, freely gives to human beings to elevate them above their natural lives" and which they receive through prayer and the sacraments; indeed the Catholic Church sees human existence as having as its whole purpose the acquisition, preservation and intensification of this supernatural life. The Church of Jesus Christ of Latter-day Saints (LDS Church or Mormons) believes in apotheosis along the lines of the Christian tradition of divinization or deification but refers to it as exaltation, or eternal life, and considers it to be accomplished by "sanctification." They believe that people may live with God throughout eternity in families and eventually become gods themselves but remain subordinate to God the Father, God the Son, and the Holy Spirit. While the primary focus of the LDS Church is on Jesus of Nazareth and his atoning sacrifice for man, Mormons believe that one purpose for Christ's mission and for his atonement is the exaltation or Christian deification of man. The third Article of Faith of Mormon Christianity states that all men may be saved from sin by the atonement of Jesus Christ, and LDS Gospel Doctrine (as published) states that all men will be saved and will be resurrected from death. However, only those who are sufficiently obedient and accept the atonement and the grace and mercy of Jesus Christ before the resurrection and final judgment will be "exalted" and receive a literal Christian deification. Mormons believe that the original Christian belief in man's divine potential gradually lost its meaning and importance in the centuries after the death of the apostles, as doctrinal changes by post-apostolic theologians caused Christians to lose sight of the true nature of God and his purpose for creating humanity. The concept of God's nature that was eventually accepted as Christian doctrine in the 4th century set divinity apart from humanity by defining the Godhead as three persons sharing a common divine substance. That classification of God in terms of a substance is not found in scripture but, in many aspects, mirrored the Greek metaphysical philosophies that are known to have influenced the thinking of Church Fathers such as Justin Martyr, Origen, and Augustine. Mormons teach that by modern revelation, God restored the knowledge that he is the literal father of our spirits (Hebrews 12:9) and that the Biblical references to God creating mankind in his image and likeness are in no way allegorical. As such, Mormons assert that as the literal offspring of God the Father (Acts 17:28-29), humans have the potential to be heirs of his glory and co-heirs with Christ (Romans 8:16-17). The glory, Mormons believe, lies not in God's substance but in his intelligence: in other words, light and truth (Doctrine and Covenants 93:36). Thus, the purpose of humans is to grow and progress to become like the Father in Heaven. Mortality is seen as a crucial step in the process in which God's spirit children gain a body, which, though formed in the image of the Father's body, is subject to pain, illness, temptation, and death. The purpose of this earth life is to learn to choose the right in the face of that opposition, thereby gaining essential experience and wisdom. The level of intelligence we attain in this life will rise in the Resurrection (Doctrine and Covenants 130:18-19). Bodies will then be immortal like those of the Father and the Son (Philippians 3:21), but the degree of glory to which each person will resurrect is contingent upon the Final Judgment (Revelation 20:13, 1 Corinthians 15:40-41). Those who are worthy to return to God's presence can continue to progress towards a fullness of God's glory, which Mormons refer to as eternal life, or exaltation (Doctrine and Covenants 76). The LDS concept of apotheosis/exaltation is expressed in LDS scriptures (Mosiah 3:19, Alma 13:12, D&C 78:7, D&C 78:22, D&C 84:4, D&C 84:23, D&C 88:68, D&C 93:28) and is expressed by a member of the Quorum of the Twelve Apostles: "Though stretched by our challenges, by living righteously and enduring well we can eventually become sufficiently more like Jesus in our traits and attributes, that one day we can dwell in the Father's presence forever and ever" (Neal Maxwell, October 1997). In early 2014, the LDS church published an essay on the official church website specifically addressing the foundations, history, and official beliefs regarding apotheosis. The essay addresses the scriptural foundations of this belief, teachings of the early Church Fathers on the subject of deificiation, and the teachings of LDS church leaders, starting with Joseph Smith. In art the matter is practical: the elevation of a figure to divine level entails certain conventions. 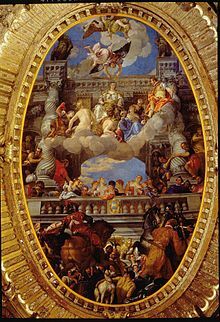 So it is that the apotheosis genre exists in Christian art as in other art. The features of the apotheosis genre may be seen in subjects that emphasize Christ's divinity (Transfiguration, Ascension, Christ Pantocrator) and that depict holy persons "in glory"—that is, in their roles as "God revealed" (Assumption, Ascension, etc.). 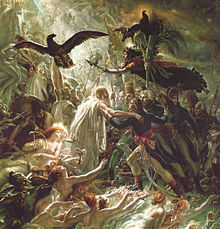 Apotheosis of French soldiers fallen in the Napoleonic Wars, Anne-Louis Girodet de Roussy-Trioson, beginning of 19th century. Ingres, The Apotheosis of Homer. Apotheosis of Gdańsk by Isaak van den Blocke. 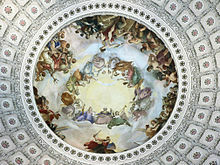 Later artists have used the concept for motives ranging from genuine respect for the deceased (Constantino Brumidi's fresco The Apotheosis of Washington on the dome of the United States Capitol Building in Washington, D.C.), to artistic comment (Salvador Dalí's or Ingres's The Apotheosis of Homer), to mock-heroic and burlesque apotheoses for comedic effect. Many modern leaders have exploited the artistic imagery if not the theology of apotheosis. Examples include Rubens's depictions of James I of England at the Banqueting House (an expression of the Divine Right of Kings) or Henry IV of France, or Appiani's apotheosis of Napoleon. The C. H. Niehaus-designed Apotheosis of St. Louis (Louis IX of France) became a symbol for St. Louis MO. The term has come to be used figuratively to refer to the elevation of a dead leader (often one who was assassinated and/or martyred) to a kind of superhuman charismatic figure and an effective erasing of all faults and controversies which were connected with his name in life - for example, Abraham Lincoln in the US, Lenin in the USSR, Yitzchak Rabin in Israel, or Kim Jong-il in North Korea. Apotheosis in music refers to the appearance of a theme in grand or exalted form. It represents the musical equivalent of the apotheosis genre in visual art, especially where the theme is connected in some way with historical persons or dramatic characters. When crowning the end of a large-scale work the apotheosis functions as a peroration, following an analogy with the art of rhetoric. Apotheosis moments abound in music, and the word itself appears in some cases. In the List of compositions by François Couperin there are 3 suites entitled "Apotheoses" (1724), Hector Berlioz used "Apotheose" as the title of the final movement of his Grande symphonie funèbre et triomphale, a work composed in 1846 for the dedication of a monument to France's war dead. Two of Pyotr Ilyich Tchaikovsky's ballets, The Sleeping Beauty and The Nutcracker, contain apotheoses as finales; the same is true of Ludwig Minkus's La Bayadère. Igor Stravinsky's composed Orpheus (ballet) and Apollo (ballet) for choreographer George Balanchine which both contain episodes entitled "Apotheose". The concluding tableau of Maurice Ravel's Ma mère l'Oye is also titled "Apotheose." Czech composer Karel Husa, concerned in 1970 about arms proliferation and environmental deterioration, named his musical response Apotheosis for This Earth. Aram Khachaturian entitled a segment of his ballet Spartacus "Sunrise and Apotheosis." Richard Wagner, referring to the lively rhythms which permeate Ludwig van Beethoven's Symphony No. 7, called it the "apotheosis of the dance". Alexander Glazunov's ballet The Seasons, Op.67 has as the concluding movement:- Autumn: Scene and Apotheosis. ^ Garnett & Mackintosh 1911. ^ , Photograph of North Korean newlywed couples in their best attire bowing before the statues of Kim Il Sung and Kim Jong Il in Pyongyang, from Reddit. ^ a b St. Athanasius, On the Incarnation of the Word 54.3 Archived 2007-07-22 at WebCite. ^ The Oxford Dictionary of the Christian Church (Oxford University Press 2005 ISBN 978-0-19-280290-3), article "deification"
^ Joseph Smith declared, "The fundamental principles of our religion are the testimony of the Apostles and Prophets, concerning Jesus Christ, that He died, was buried, and rose again the third day, and ascended into heaven; and all other things which pertain to our religion are only appendages to it" (See Teachings of the Prophet Joseph Smith, sel. Joseph Fielding Smith , 121). ^ Teachings of the Prophet Joseph Smith, pp. 345-46. ^ "Trinity > History of Trinitarian Doctrines (Stanford Encyclopedia of Philosophy)". plato.stanford.edu. ^ "Doctrine and Covenants 93". www.lds.org. Archived from the original on 2013-12-05. ^ Saints, The Church of Jesus Christ of Latter Day. "Becoming Like God". www.lds.org. Archived from the original on 2014-11-29. ^ Grove, Sir George (1962). Beethoven and his nine symphonies (3rd ed.). New York: Dover Publications. pp. 228–271. OCLC 705665. Jean-Claude Richard, "Énée, Romulus, César et les funérailles impériales", in:Mélanges de l'École française de Rome vol. 78, 1966, pp. 67–78. Bernadette Liou-Gille, "Divinisation des morts dans la Rome ancienne", in: Revue Belge de Philologie vol. 71, 1993, pp. 107–115. Garnett, Richard; Mackintosh, Robert (1911). "Apotheosis" . In Chisholm, Hugh. Encyclopædia Britannica. 2 (11th ed.). Cambridge University Press. pp. 206–207. Look up apotheosis in Wiktionary, the free dictionary. Wikimedia Commons has media related to Apotheosis.